Runners use meet to gauge how their season is going. Cross country runners from all over the state will converge in Belfast on Saturday for the annual Festival of Champions. With a few races under each team’s belt, the event is often used by coaches and runners as a measuring stick to gauge where teams and individuals stand, and whether strategy needs to be changed for the rest of the season. The course located at the Troy Howard Middle School, is noted as fairly flat and fast for runners. This will be a welcome change for some teams, like Maranacook, who have spent the first few races on hilly courses. There is guaranteed to be a new boys champion in the race Saturday. Last year’s champion, Luke Laverdiere of Yarmouth, has graduated. But Falmouth’s Sofie Matson returns as the defending girls champion. Only a sophomore, Matson took the crown as a freshman last season with a time of 18:17.33. That time was nearly 19 seconds faster than second-place finisher Sophia Laukli of Yarmouth. As expected, Maranacook has paced itself right along over the first few races of the season, showing top runners for both the boys and the girls teams. The boys are led by senior and veteran runner Luke Bartol, who finished sixth in the KVAC B championship race last season. He’s picked right up from where he finished last season. In five races this season, Bartol has four top-five finishes, and finished first in a KVAC race August 31 at his home course in Readfield. The Maranacook girls have been led by junior Molly McGrail, who continues the momentum that began last spring during outdoor track and field season. So far this fall, McGrail has had top-five finishes in all five of her races, and like Bartol, finished first at her home course back on August 31. She also has two second-place finishes. The Messalonskee girls have been led by not one, but two successful runners in senior Peyton Arbour and sophomore Charlotte Wentworth. The duo are extremely competitive runners. 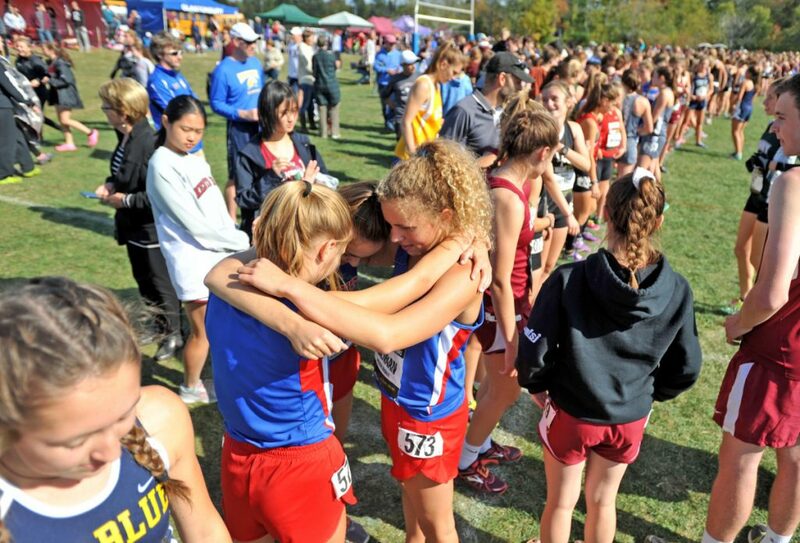 Not just with fellow KVAC runners, but with each other, as Holman can attest. Wentworth has had the edge in the personal rivalry — she’s had top-five finishes in four KVAC races this season — but both have had top-five finishes in two races this year. Their best effort of the season so far may have been in their latest race. Wentworth finished second and Arbour third in a race September 20 at Lincoln Academy in Newcastle. On the boys side, Holman has been impressed with the improvement of Elijah Ross throughout the season. Mt. Blue junior Kahryn Cullenberg is taking no prisoners on the course this season. In three KVAC races this season, Cullenberg has two victories, picking up wins on August 31 on her home course in Farmington, as well as a win September 20 at Lincoln Academy. She placed second in a September 14 race at Leavitt High School in Turner, behind Edward Little’s Jillian Richardson.